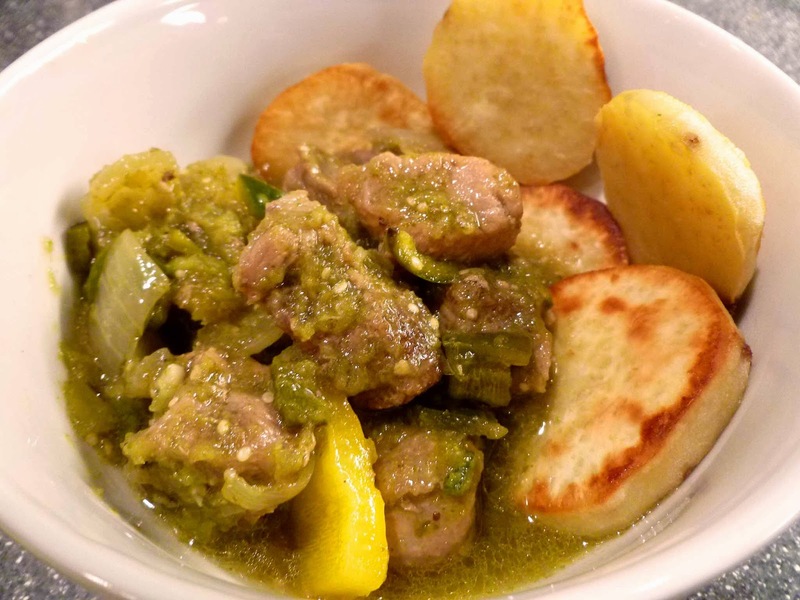 Chile Verde is one of my all time favorite dishes. At this time of year you can find all the vegetables locally and organic in our area--even the tomatillos are coming out of California now so if you can't get to the farmer's market you can still find some domestic varieties out there. This time out I used a roast from Prather Ranch and cut it into chunks. I also added a "base" of roasted Japanese yams (white flesh, dark red skin) to take some of the heat off--the jalapeno can get a little spicy! One other little trick is to brown the meat in lard--you can get it really hot and get the sear on the pork that creates that wonderful crisp exterior with the super tender insides of each little chunk of pork. This is a very simple recipe from www.Food.com, there are myriad variations especially all up and down the Hispanic/Latin countries--be sure to do a little research and have fun with making this your own favorite family meal. Trim off any excess fat from the pork and cut into 2 inch squares. In a large (6 to 8 quart) stock pot, over a high heat, sear the pork in the lard until golden brown. Remove the pork from the pot and pour off half of the oil or fat drippings and add 2 tablespoons of olive oil to the same pot. Over a medium heat, add the chopped onion, garlic, salt, and pepper and saute until transparent. Add the cumin, pork, and chicken stock, and cook for 1/2 hour. Add the poblanos, jalapenos, and bell peppers. Puree the tomatillos and cilantro in a blender in batches. Add them to the pot, bring the stew to a simmer and cook a minimum additional 30 to 45 minutes and up to 2 hours on a very low heat. One average sized sweet potato will feed 2 people. Preheat your oven to 425 or 400 if your oven runs hot. Peel and evenly slice the potato into disks. Evenly coat with coconut oil or olive oil and spread in a single layer on a baking sheet. Roast for 10 minutes then flip each potato over to get even browning. Go for another 10 mins., peeking in at around the 8 min. mark to make sure nothing is burning. This will happen in the blink of an eye so keep watch! Sprinkle with sea salt to taste. And then it was Fall. I have to say, I missed you all this Summer. I was making salads, eating raw fruits and vegetables, grilling pasture raised meats--for some reason pork captured a lot of my attention. We traveled to France on an incredible odyssey. While I don't think their children are necessarily better behaved than ours, as a population they do enjoy better overall health and look a lot happier and fit than most Americans. While I found a lot of the food there to be repetitive, their go-to methods of preparation are far better than ours and is one of the factors, I believe, to their overall condition. 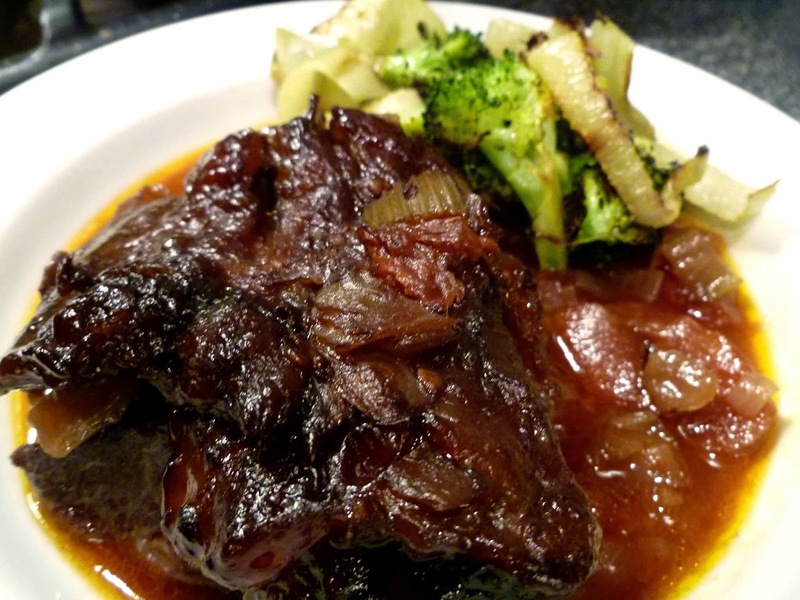 Take braising. You use a lower priced quality piece of meat that is thought of as "tough" and you turn it into the most tender, melt-in-your-mouth, why haven't you made this for us before? meal that your family and guests will never forget. I did this with Beef Cheeks last night from Tara Firma Farms and the kids got to take leftovers to school today. Beef Cheeks are a little harder to come by, just let your butcher know you are interested they'll get them for you, but if you just happen to see them, buy them up. I used 4 16oz. cheeks last night and yes, there were leftovers, but not a ton. I paired this also with some roasted fennel from Tomatero Farm and broccoli from Swanton Berry Farm. Heat lard in an ovenproof 6-10-quart wide heavy pot over moderately high heat until hot but not smoking. While oil is heating, pat beef cheeks dry and season with salt and pepper. Brown beef, without crowding, on all sides, about 20 minutes total, and transfer with tongs to a bowl. Pour off fat from pot, then add 2 tablespoons olive oil and cook onion, carrot, and celery over moderately low heat, stirring occasionally, until softened, about 10 minutes. Return cheeks (with any juices) to pot and add tomatoes with juice, salt, and pepper. Bring to a simmer, then braise, covered, in middle of oven until very tender, about 3 hours. When done, remove cheeks from oven, keep covered and set aside. Turn oven up to 400-425--if you have a convection feature on your oven use this. Slice fennel, wash and chop broccoli into florets. If doing sweet potatoes too, peel and slice into discs. Toss the fennel and broccoli with the olive oil and spread in a single layer on a baking sheet. Toss the sliced sweet potato with the coconut oil, covering every disc as well as possible (you may have to do this with your hands if the oil is solidified). Spread on a foil lined baking sheet and season with a little salt. You can put both sheets in the oven at once. At the 10 min. mark stir the vegetables, flipping the sweet potatoes over so they will evenly brown. Set the timer for an additional 10 min. checking on everything at about min. 8 to make sure nothing is burning. Stir everything up again and let them go until you get to your desired crispness from 2-5 min. longer. Ladle everything into a bowl, the sauce is heavenly with the extra vegetables added.